Posted December 8, 2015 by Heather Michet & filed under Food. Gluten is a naturally occurring component in several grains. Wheat has been the targeted as “the troublemaker” for everything from IBS (Irritable Bowel Syndrome) to weight gain and chronic inflammation, to name only a few health afflictions. I love whole grain breads, muffins and other baked goods. Yet I’m the first one to admit that my body functions much better when I stay away from consuming wheat. My energy is higher, my thinking is clearer and I can avoid the instant belly that appears when I’ve ingested wheat. 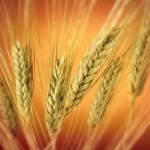 This article from Sarah at TheHealthyHomeEconomist.com delivers some big surprises around wheat, gluten sensitivity and commercial (vs. sustainable) farming. She has gathered serious research showing that it may well be the heavy spraying of the herbicide/pesticide Roundup (compliments of Monsanto) on grain crops in the U.S. that is the culprit in wheat, not the gluten itself. After reading this, what do you think? What are your experiences with grains and gluten? Join us in the conversation with your comments.